Have you found an online vendor selling Foursquare Dominus? Beautiful aroma of fruits and cognac influences. 56 % but still easily sippable. Lovely golden colour upon pouring , no caramel colouring here !! I could go on but lets just say this is pure proper rum with nothing added and tastes fantastic.. and it even comes with a cork and not a screwcap ! The wonders will never cease. 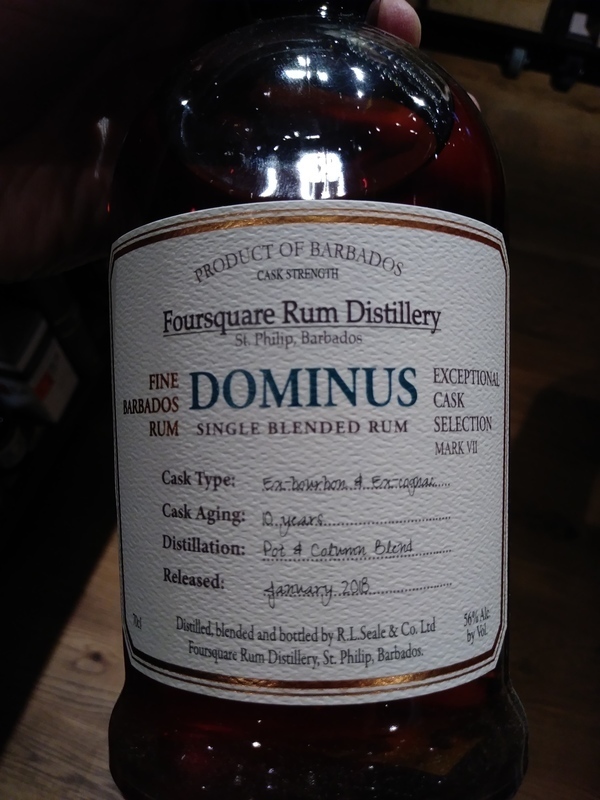 Enjoyed a bottle of Foursquare Dominus 10y Rum while in London. Pretty decent bottle and label design. Golden color. 3 year aging in ex bourbon barrels and further 7 year aging in ex cognac barrels. Very unique flavor profile with mild oak mixed nicely with much more prevalent cognac flavors. Very well done indeed. The strength of 56% is an asset as well as something that detracts. I find that high strength rums quite often mask the nose, and to me, the nose is half the enjoyment. However, on the palate, the elevated alcohol levels are superbly well integrated. Sure there is a burn. That is to be expected from something at 56%, but to me at least (!!) it isn't harsh and it leaves the most incredibly beautiful warmth. Foursquare has done it again! Everything I have had from Mr. Seale I have thoroughly enjoyed! Not as sweet as the Port Cask or Zin Cask expressions but plenty of dark, red fruit flavors. If you see it get it, you won't be disappointed! Truely fantastic rum! 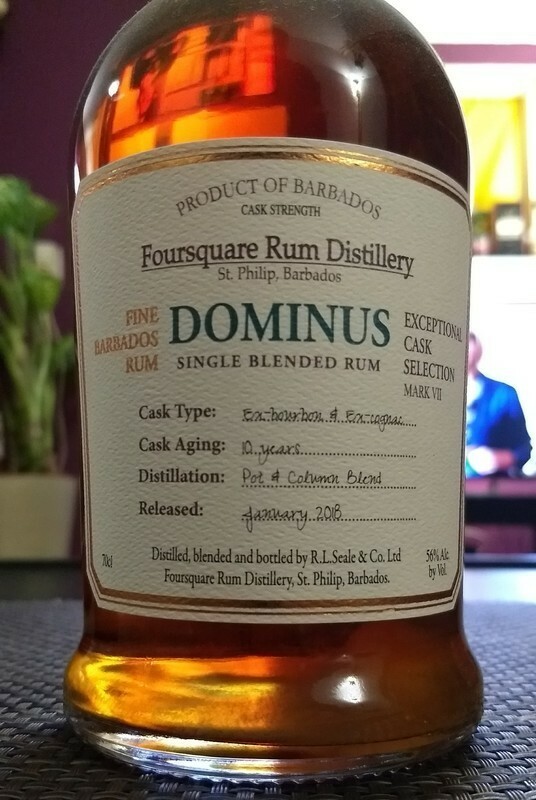 Need a new rating just for Foursquare rums which stands apart most other rums. It is one of the best Foursquares, but the cognac casks make it slightly uniform. Anyways, one of the best rums at all. But not my favorite foursquare. Still, a master class in distilling. Not my favorite but still a must buy if you can find a bottle. Foursquare continues their exceptional cask series with Dominus and it's another great one. The nose is very inviting with hints of orange and other fruits. The first taste can be a little strong because of the 56% ABV but after adding a drop of water the taste of the bourbon and cognac casks really comes through and you begin to taste the complexity of the rum. I've been trying to decide how this compares with some of their previous releases like the Port or Zinfandel casks but have just decided to enjoy each on their own merits and like the others this one is amazing! warm and round taste with a lot of Christmas spices, oak barrels, clear elements of cognac, orange peel, dark chocolate, marmalade and dark dried fruit. The taste is long and grows every time you taste. Dominus (Exceptional Cask Selection Mark VII) is een blend van pot en column still distillaat die tien jaar gerijpt heeft in ex-bourbon vaten (3 jaar) en cognac vaten (7 jaar) en gebotteld is op 56%. Zonder toegevoegde suiker, smaakversterkers of kleurstoffen. Dit is een van de lekkerste Foursquare rum die ik tot nu toe geproeft heb. Aroma, smaak en afdronk zijn allemaal top. One of three that Foursquare released in 2018 this is number seven in the Exceptional Cask Series. Bottled at 56% this has been aged for a total of 10 years. 3 years in ex-bourbon casks and 7 years in ex-cognac. Some indicates this follows the release of Criterian but I can't be sure about this. Despite the higher abv this is deceptionally easy to drink. Rich, spicy. The finish is satisfying long. A drop of water does release some further notes of citrus and sweetness.